If the accelerated pace with which Porsche is creating versions of its "new" 911 Carrera, which are now almost all powered by turbocharged engines, is any indication, the Stuttgart-based manufacturer is currently accelerating at full throttle. The Carrera and Carrera S were presented at the Frankfurt Auto Show, the Carrera 4 and 4S launched at the Tokyo Show, and the Targa 4 and Targa 4S were unveiled in Los Angeles. Most recently, it was the Turbo and Turbo S's turn in the limelight at the Detroit Auto Show. Barely a week after this unveiling, we found ourselves at the Kyalami Racing Circuit in South Africa to try these newcomers for the first time. Although turbocharging is now nearly ubiquitous in the 911 Carrera lineup, the Turbo and Turbo S versions retain their distinctive nomenclature and remain at the top of the pyramid. Also: A Hybrid Porsche 911 In The Works? This was my first question. I had heard about this track located in a Johannesburg suburb where the late Gilles Villeneuve won a Formula One Grand Prix with Ferrari in 1979. But upon arrival, I discovered that the circuit had been auctioned off in 2014 to Toby Venter, importer of the Porsche brand for South Africa, and that he had undertaken renovations at considerable expense to restore its former glory. The course has been modified, the track itself is ready and all that's left is to put the finishing touches on the landscaping and new facilities above the garages—details that should be done by the summer of 2016. So, it was on this almost-brand-new playground that I first laid my hands on the 2017 Porsche 911 Turbo and Turbo S.
The new 911 Turbo still has the moving aerodynamic elements, both in front and in back, that were introduced on the previous version. They help generate 132 kilos of downforce at 300 kilometres/hour, according to Porsche's engineers. As for the look, some subtle modifications were made to the front end and headlights, including new factory-standard LED lamps. The car's tail end has also been enhanced with new three-dimensional lights, and now, the rear hood features vertical strips on either side of a central air intake to supply the engine. It had rained during the night so the circuit was soaked, and I went out to do a few laps by myself as a warm-up. Fortunately, the track dried quickly, and we were able to get to more serious business after installing a video camera and microphone on board. The 911 Turbo’s twin-turbo, 3.8-litre six-cylinder boxer engine generates 540 horsepower—580 horsepower in the case of the Turbo S—and we felt the phenomenal forward thrust right away when leaving the pits. In addition to deploying 20 additional horsepower, the engine incorporates a function called Dynamic Boost, which maintains the pressure of the turbos, even when I took my foot off the accelerator before entering a corner, and immediately gave back full power as soon as I reaccelerated before the apex. This feature makes the ride more dynamic on the track—to the point that the 911 Turbo almost passes for a sports car with a naturally aspirated engine by eliminating the boost lag that is typical of turbocharged engines. The other new feature that makes the 911 even more playful than before is the PSM Sport function that guarantees good drift angles in turns. This leverages the exceptional machine’s full potential while keeping the Porsche Stability Management system active as you drive around the track, in case of excess enthusiasm or an error in judgment by the driver. Basically, you always have a safety net at your disposal. These two new features alone make the new 911 Turbo more approachable and easier for experienced drivers to tame. With each lap, I found myself exclaiming “wow, wow, wow!” in a display of my boundless admiration for the brand’s engineers who, time and time again, always find a way to optimize the dynamics and performance level of these exceptional cars. After meeting the 911 on the track, it was time head back to the pits for a closer look at the new features on the PCM 4 (Porsche Communication Management) system with online navigation, voice command and a seven-inch colour touchscreen that allows swiping, sliding, zoom and two-finger rotation. The touch screen responds to hand movement and switches automatically from display to control mode. PCM 4 also integrates Apple CarPlay, but not Android Auto. The brass at Porsche explained that 70 to 80 percent of their clients use Apple products. Porsche is also offering a new application called Porsche Car Connect for iOS and Android that can be downloaded onto a smart phone and help locate the car in real time. It also tells you the fuel level, mileage, fuel consumption and average speed. It’s practical if, in a moment of madness, you lend your car to someone else. All versions of the Porsche 911 Turbo will be available in dealerships in Canada in mid-2016, and you’ll need deep pockets to get one. The prices are $181,800 for the 911 Turbo coupé, $195,800 for the 911 Turbo cabriolet, $214,800 for the Turbo S coupé, and $228,000 for the Turbo S cabriolet. And price may be the main weakness of these beasts, which are simultaneously fierce yet civilized. Maintenance costs are also expected to run high, especially considering how often you’ll have to replace the tires. 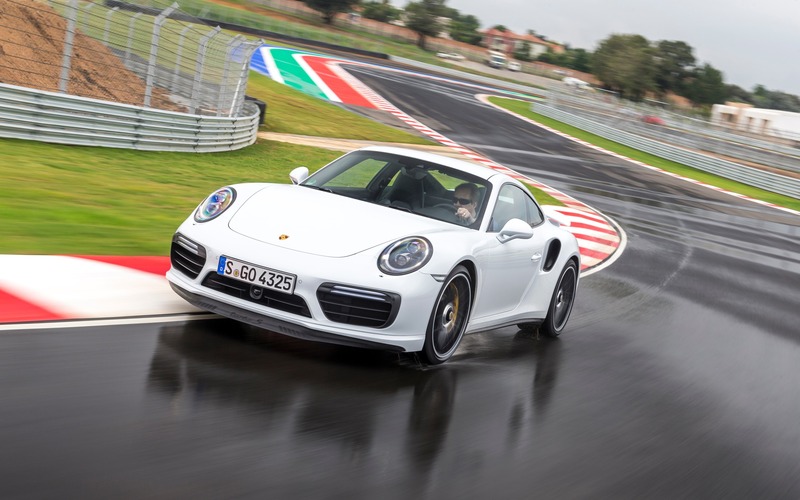 That’s the price you pay to drive a car as exceptional as the new Porsche 911 Turbo. 6/10	Better fuel economy compared to the previous version, but the actual consumption will depend largely on your driving style. 8/10	Dynamic, even ferocious, on the track, the 911 Turbo can become docile and completely civilized on public roads. 9/10	Nothing less than astounding. 8/10	The new PCM 4 system with Apple CarPlay is very user-friendly. 9/10	An absolute beast, at once ferocious and civilized. The only drawback is the purchase price and high maintenance costs. Electric A Hybrid Porsche 911 In The Works?